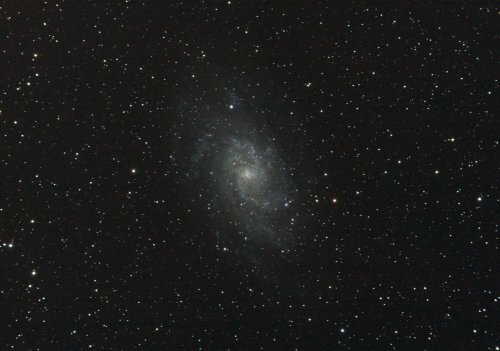 M33 galaxy in Triangulum taken by Graham Winstanley on 9 Dec 2015. The image consists of 11 x 5 min exp at ISO400. 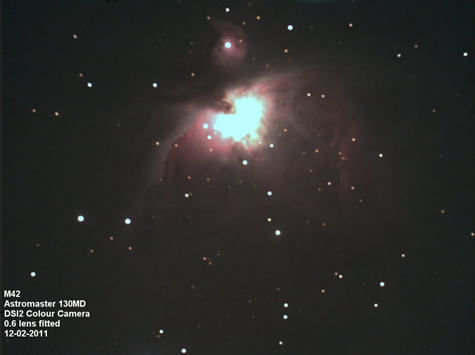 He used a Skywatcher ED80 on an EQ6 mount with ASI120 camera guiding using PHD2. Capture camera - Canon 1100D, software – Backyard EOS. Processed in Pixinsight (with bias, dark and flat frames) and Photoshop CS2. 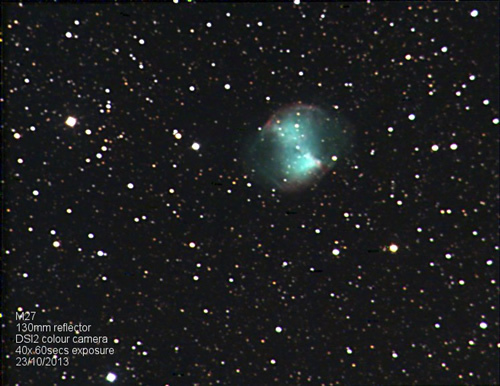 M27 Dumbell Nebula taken by Graham Winstanley on 6 Nov 2015. 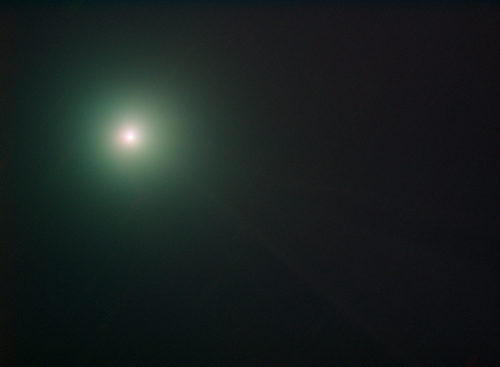 The image consists of 10 x 5 min exposures at ISO400. He has cropped the image by approx. 50% post processing. 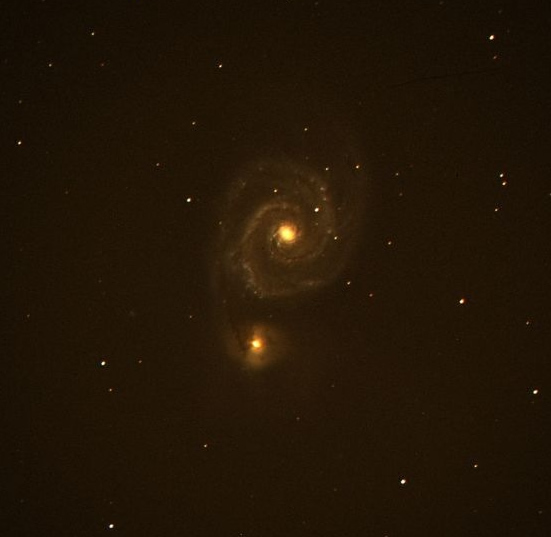 He used a Skywatcher ED80 on an EQ6 mount with a ASI120 camera guiding using PHD2. Capture camera - Canon 1100D, software – Backyard EOS. 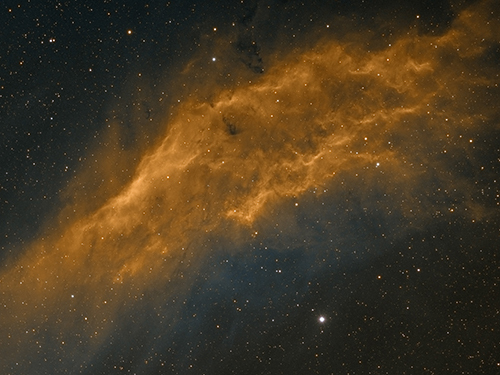 Processed in Pixinsight (with bias, dark and flat frames) and Photoshop CS2. 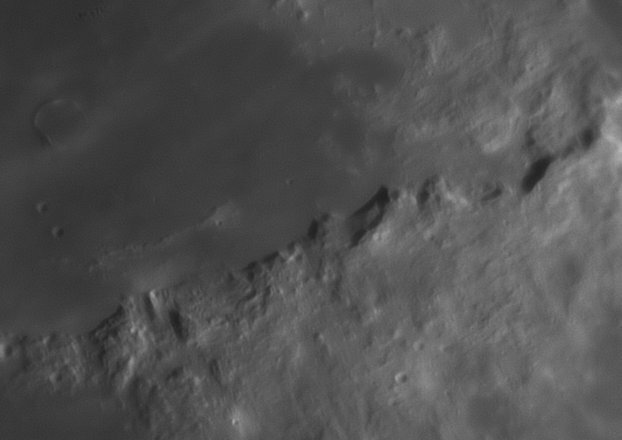 Part of the Lunar Apennine Mountains Imaged by Phil Norton using the society telescope on 22nd October 2015. 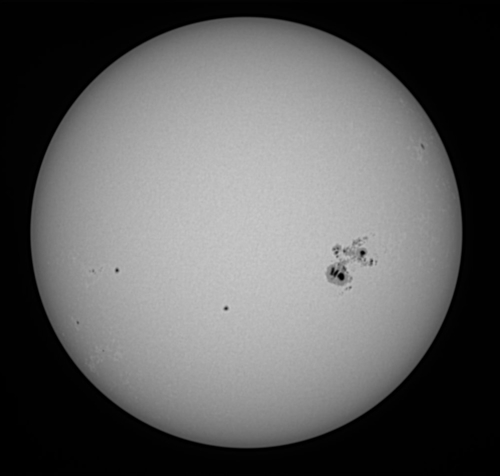 He took this image with an ASI120MM camera with a x4 Barlow lens . Snowball Nebula (centre) by Dave McCracken using the society telescope taken on 22nd October 2015. 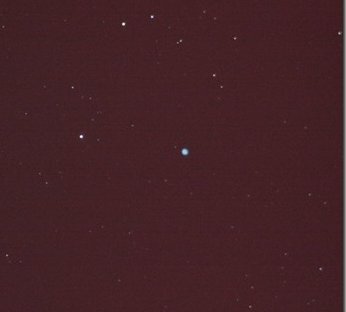 He took this image of the ‘Blue Snowball Nebula’ (NGC 7662) with his DSLR camera. 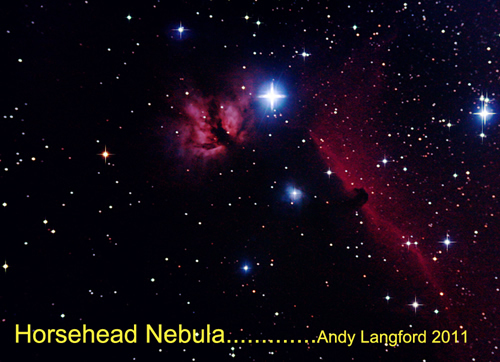 The nebula only became apparent during the processing of his images. NGC1499 The Californina Nebula in narrowband taken by Mick Hunt in his Garden Observatory- October 2015. 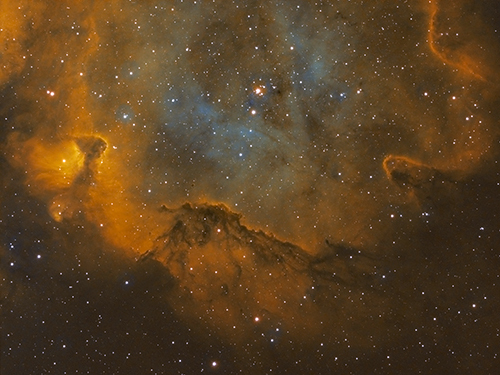 IC1848 the Soul Nebula taken by Mick Hunt in his Garden Observatory- October 2015. 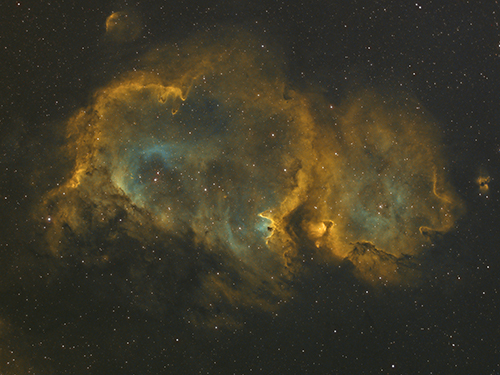 Detailed image of IC1848 the Soul Nebula taken by Mick Hunt in his Garden Observatory- September 2015. 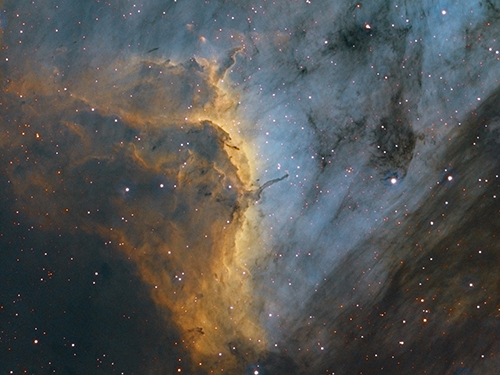 IC5070 the Pelican Nebula taken by Mick Hunt in his Garden Observatory- June 2015. 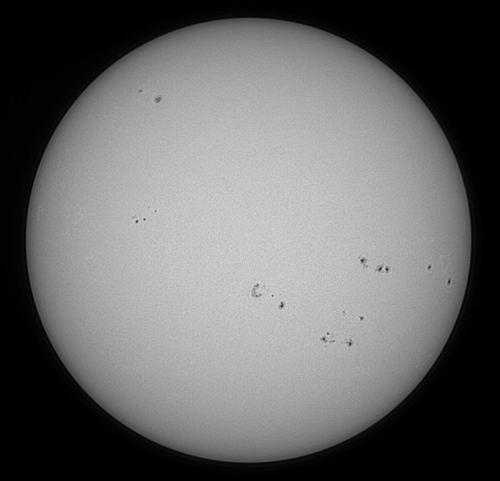 White light Solar image by Dave McCracken of Lincoln Astronomical Society taken on 18th June 2015. He took this image with a Vixen 110 on a Vixen GP GEM in white light and then compared it to an image from space weather - the two main groups 2371 left and 2367 below centre seem to have been captured well. He is not sure if the mottling is from the DSLR camera or solar granulation. 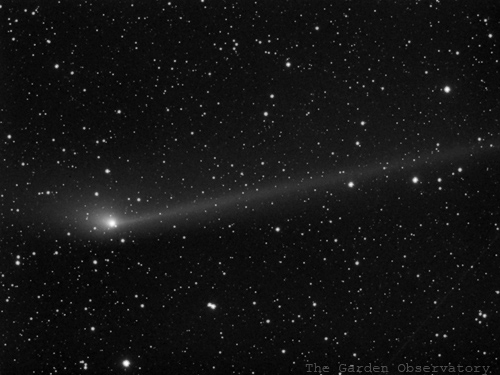 Update on Comet Lovejoy by Dave McCracken of Lincoln Astronomical Society. 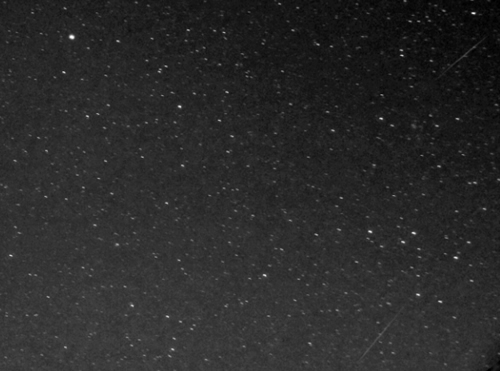 The two faint stars to right diagonal are TYC-69-792-1 and TYC-72-692-1. At angle 45 degrees up / right to comet is V479 Tauri10 RAW X 20 second ISO 1600, f5.6, 300 mm lens piggy backed on Fork mounted C8Pre-processed individually in Photoshop in then stacked in ‘Deep Sky Stacker’ as final image. Original Raw files available on request. 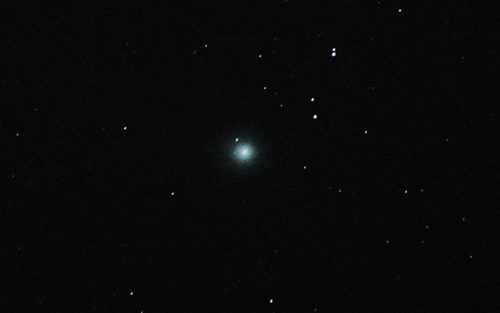 Comet Lovejoy taken by Dave McCraken of Lincoln Astronomical Society. Captured on 10/01/2015 at about 21:30 GMT at position 3h 56m + 04d 25m +/- 5m by Digital setting circles. 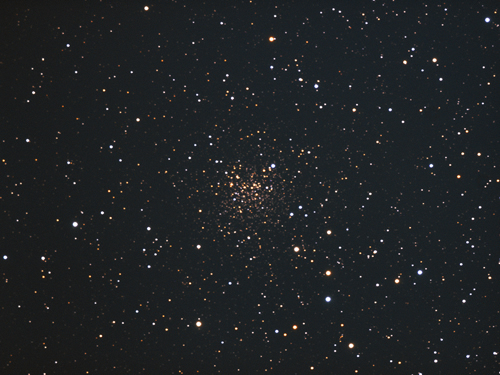 NGC2158 (The small globular cluster next to M35) taken by Mick Hunt of Lincoln Astronomical Society in his Garden Observatory. Mick says It's small because its way beyond M35 and a lot older but it looks big to me. 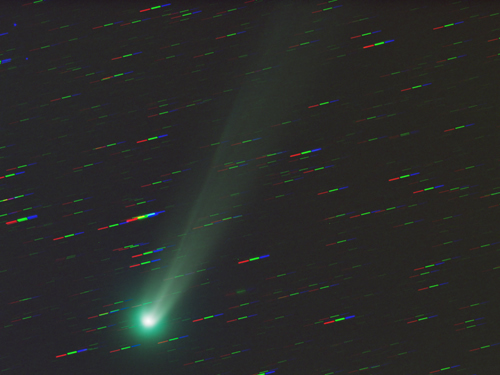 A closeup of Comet Lovely C/2014 Q2 showing just the start of that wispy tail, taken by Mick Hunt of Lincoln Astronomical Socirty. 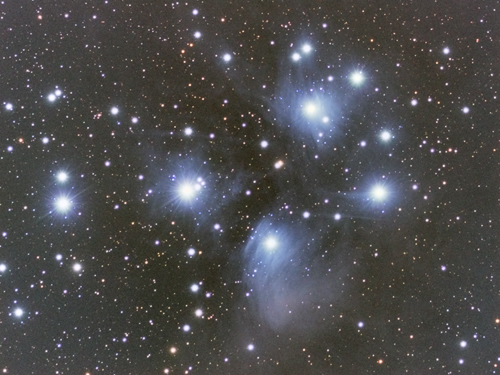 This was taken by Phil Norton of Lincoln Astronomical Society on 30th December at 1918 hrs. 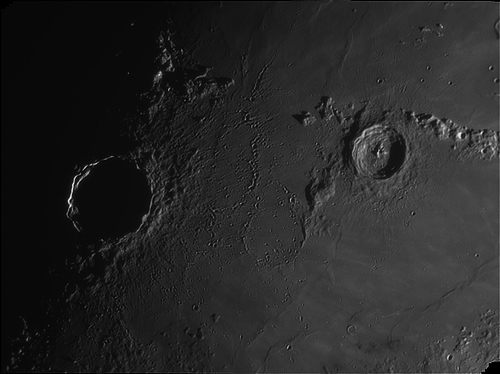 Sunrise over Copernicus with Erastophenes on the right. 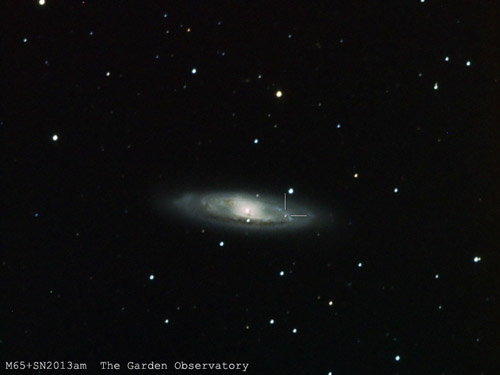 12 inch telescope F10 ASI120mm camera. Autostakkert and Astra Imaging processing. 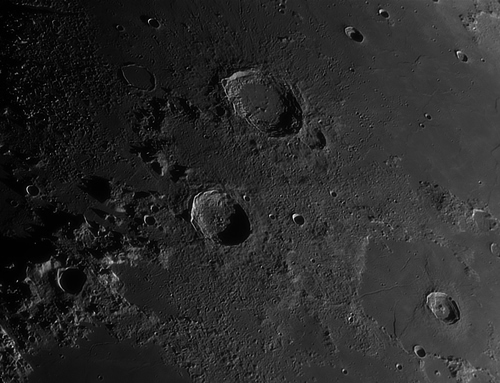 Craters Aristoteles (top) and Eudoxus (centre) taken by Phil Norton of Lincoln Astronomical Society on 28th December 2014. 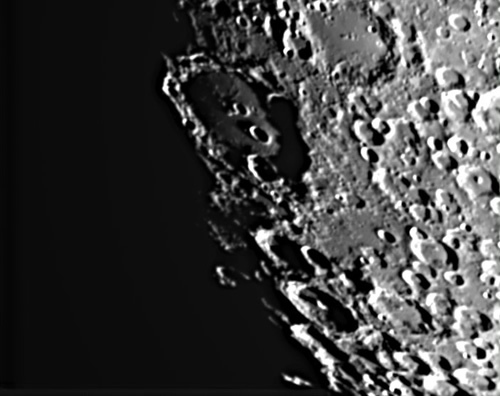 The telescope was his 300mm F5 Newtonian reflector with a x2 barlow fitted. The camera was the ZWO ASI120MM. 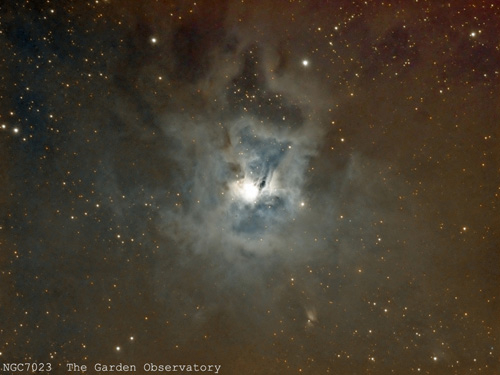 Processing was in AstraImage3 and Registax6. Resolution is 0.5Km per pixel. For a sense of scale, the centre crator is 42 Miles in diameter. 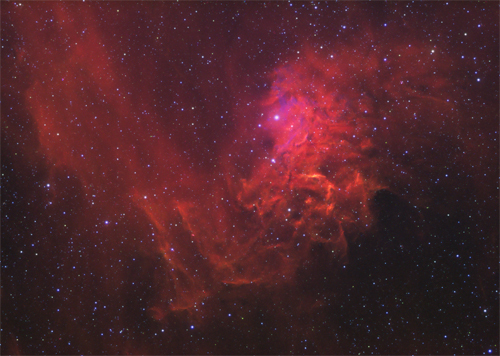 IC405 the Flaming Star Nebula by Mick Hunt of Lincoln Astronomical Society. 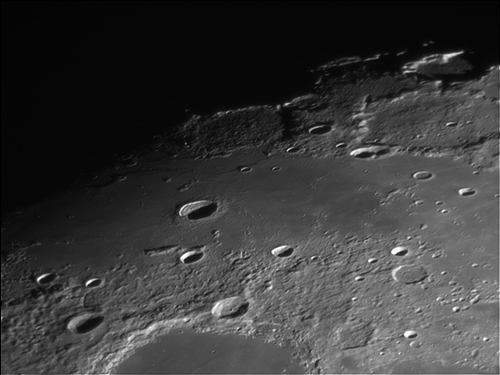 Crater Harpaulus taken by Phil Norton of Lincoln Astronimical Society on Wednesday 3rd December 2014. 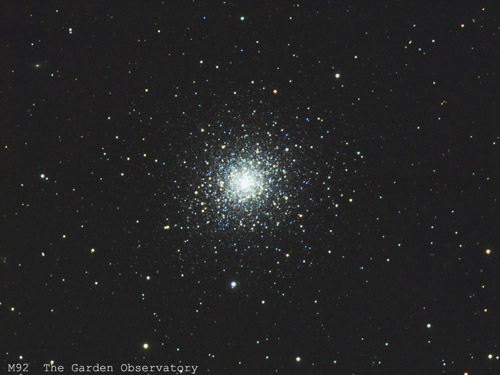 The image was taken using his 12" Newtonian Reflector Telescope set to F10. The camera was a ZWO ASI120mm. 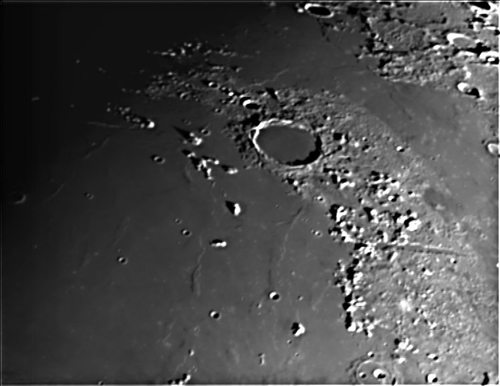 Crater Gassendi taken by Phil Norton of Lincoln Astronimical Society on Wednesday 3rd December 2014. 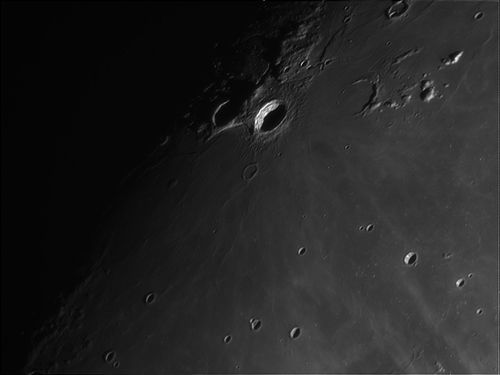 Crater Aristarchus taken by Phil Norton of Lincoln Astronimical Society on Wednesday 3rd December 2014. 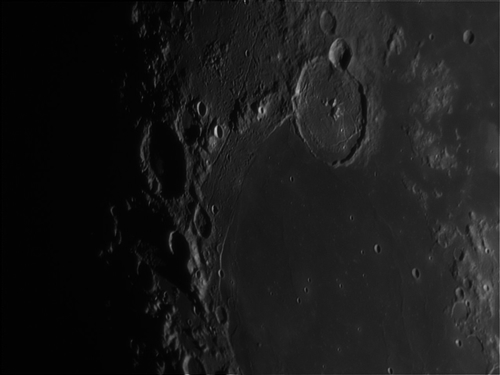 Crater Clavius taken by Phil Norton of Lincoln Astronimical Society on Wednesday 3rd December 2014. 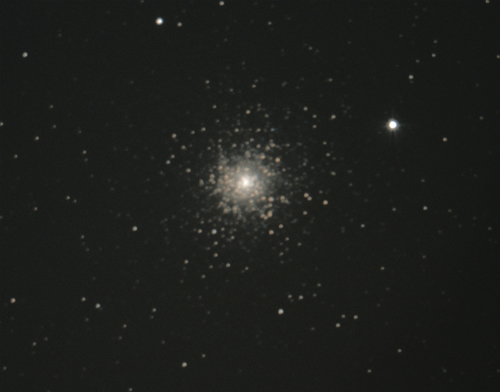 M15 globular cluster in Pegasus by Graham Winstanley of Lincoln Astronomical Society. 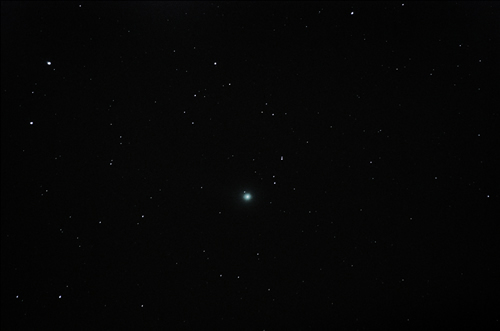 50 x 15sec exposures through the society’s 12” Newtonian using Canon 1100D. Stacked in Deep Sky Stacker with dark frames. Taken on 12 November 2014. Image of The Moon taken by Phil Norton of Lincoln Astronomical Society on 31st October 2014 at 1641 UT in blue sky using a Celestron70 travelscope on the flimsy undriven altazimuth mount that comes with the telescope. This is a great example of what can be achieved with very affordable modest kit. 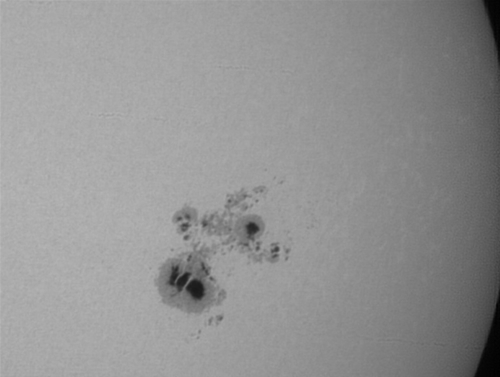 Three Images of the Sun showing Sunspot Group AR2192 taken by Phil Norton of Lincoln Astronomical Society. They were taken on Saturday 25th October 2014. The telescope was mounted on an Astromaster 130MD tripod. 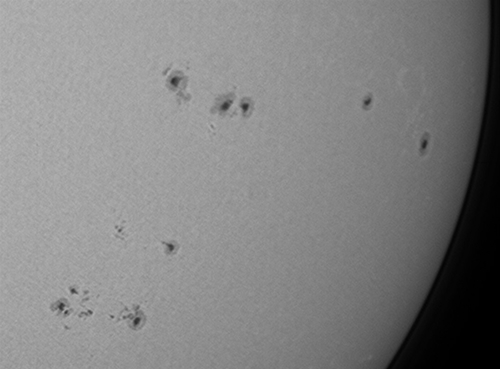 This one showing the Sunspot Group in close up. 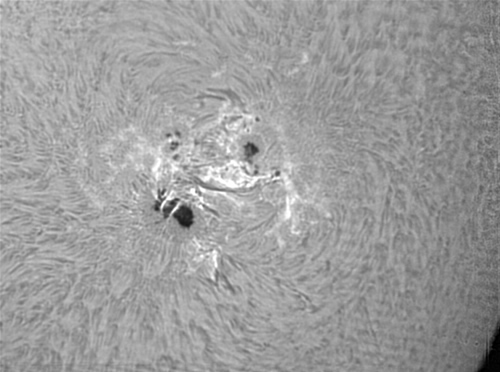 He used his Coronado Hydrogen Alpha telescope with a x3 Barlow fitted for this one. He used his Coronado Hydrogen Alpha telescope with a x3 Barlow fitted. The camera was a ZWOptical ASI120MM. 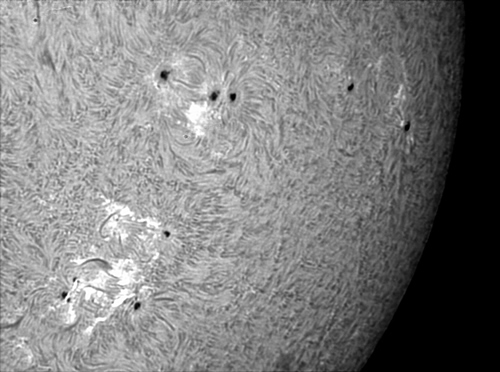 Image of the full sun by Phil Norton of Lincoln Astronomical Society taken on Friday 18th April 2014 with an ETX 70 telescope with a solar filter. 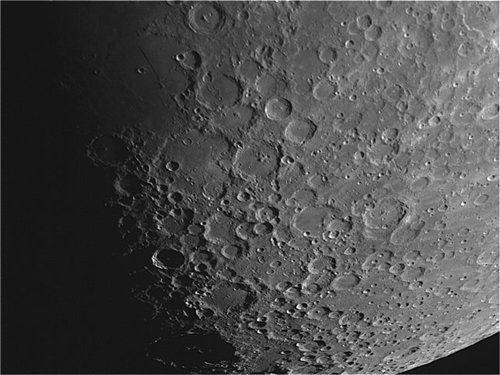 This enlarged image was taken by Phil Norton at the same time as the image above but with a x3 Barlow fitted. 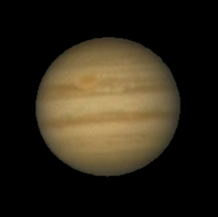 Image of Jupiter by Graham Winstanley of Lincoln Astronomical Society taken on 15th April 2014 using the LAS 12.5" telescope. 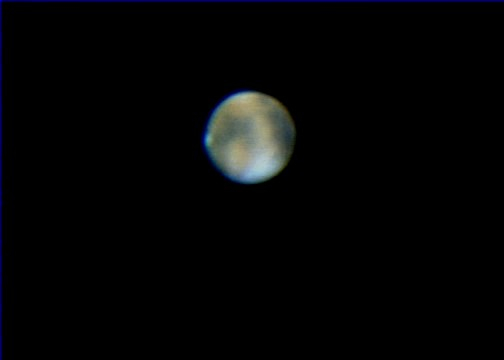 Image of Mars by Phil Norton of Lincoln Astronomical Society taken on Friday 18th April 2014 using Phil's 12" Newtonian Telescope in North Hykeham. He says there was heavy turbulence and he just couldn't get it right. We believe you Phil! 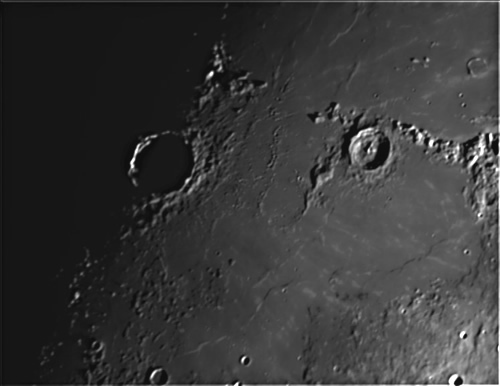 Image of the Moon by Graham Winstanley of Lincoln Astronomical Society showing Crator Plato with bright rim and shadows on the crater floor. 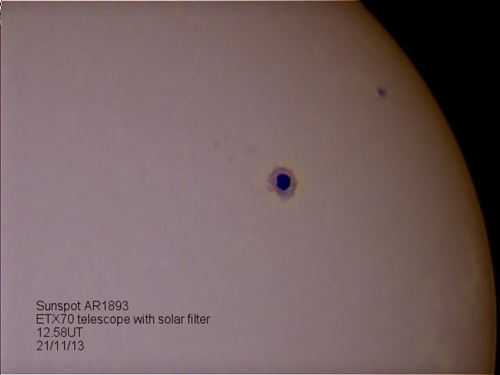 Taken on Tuesday 15th April 2014 using the 12.5" society telescope and a 3 x Barlow Lens using a Philips Webcam. 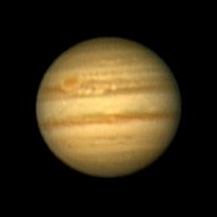 Jupiter taken by Phil Norton of Lincoln Astronomical Society 12th March 2014. Telescope was a 300mm newtonian reflector at F30. Camera was a Philip’s SPC900NC webcam. 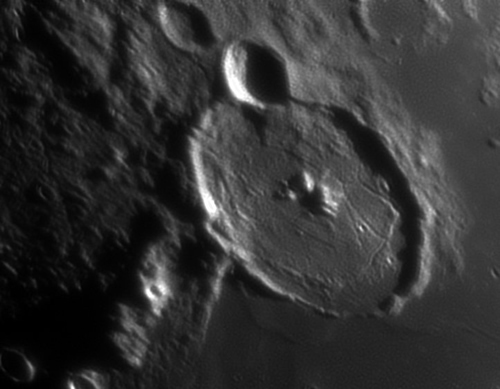 This is the crater Gassendi taken on a 300mm Newtonian at F30. 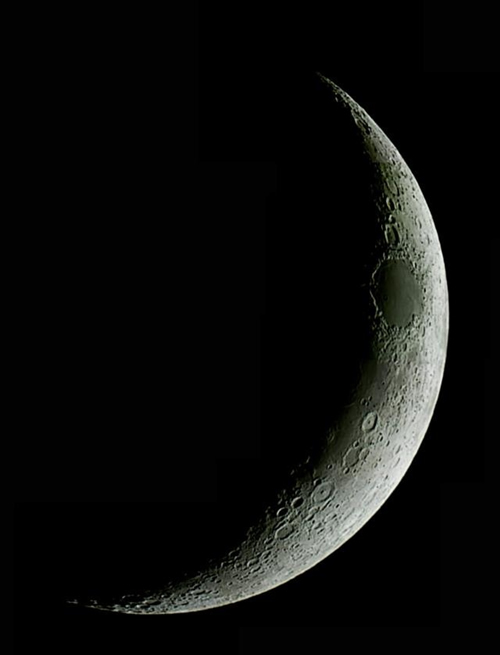 The camera was a Meade DSI2 together with the Meade Envisage Software. 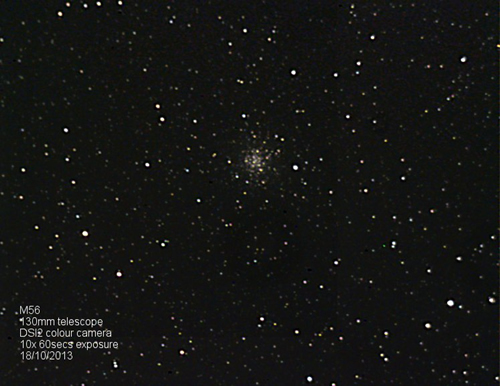 Processing was with Registax 5 and Astra Image 3.0SI software. This is taken using a 300mm Newtonian reflector at F20. The camera used was a Philips SPC900NC webcam. 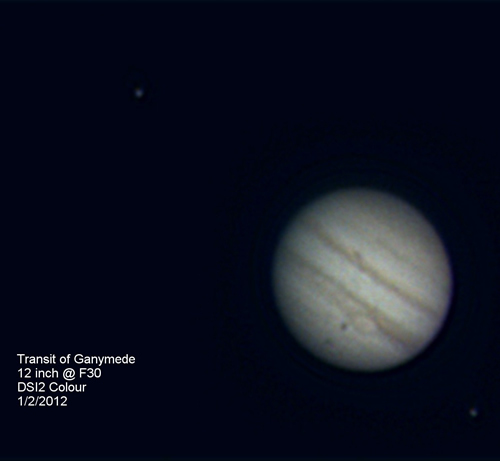 The image shows the shadows of moons Ganymede and Io. From the far right- the dot is the moon Ganymede. The right hand shadow is that of Ganymede. Against the surface of Jupiter is the moon Io and it’s shadow near the left side of the planet. Conditions were very difficult with lots of high Cirrus cloud about. using his 300mm telescope with a Philips SPC900NC Webcam. 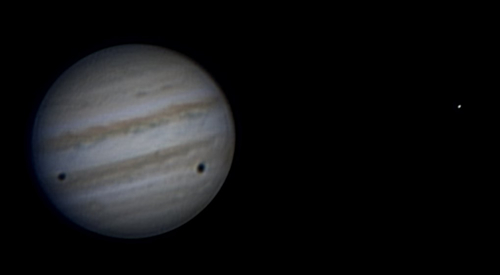 The video shows Europa and its shadow as they moved between 18-30pm and 21-00pm on 27th February. It also shows how the seeing changed during the period. 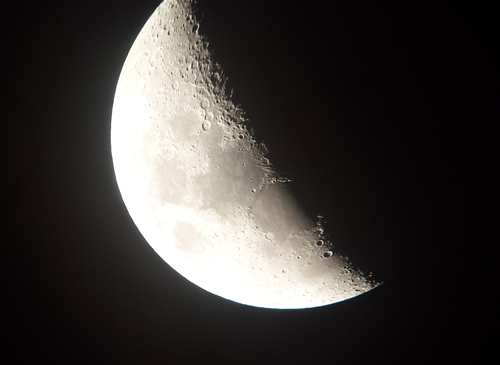 taken on Friday 8th March 2014 using a Samsumg Galaxy S4 Smartphone through the telescope eyepiece. 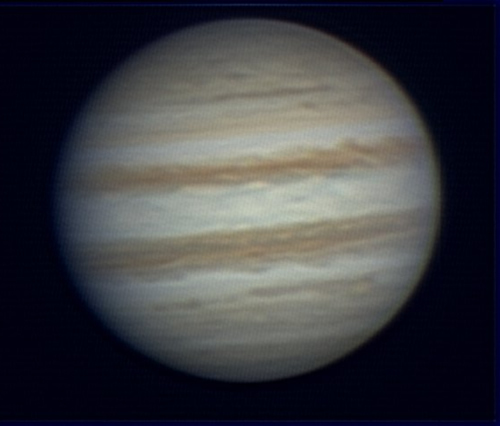 Images of Jupiter by Phil Norton. and a Philips SPC900NC Webcam. 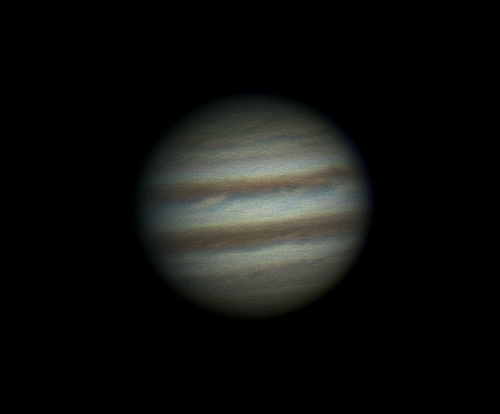 Taken on the 130mm Astromaster with a x4 barlow, so it's F20. The time was 4pm Friday 7th February 2014 with the sun in the sky and also in the wind. 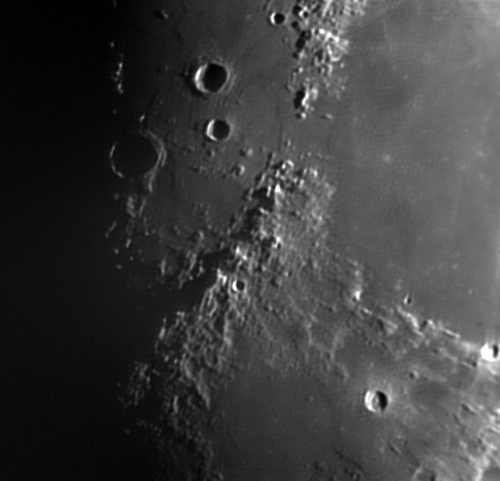 The picture is of Crater Archimedes on the left and the Apollo 15 landing site in the centre of the image. DSI2 camera- 100 images stacked. 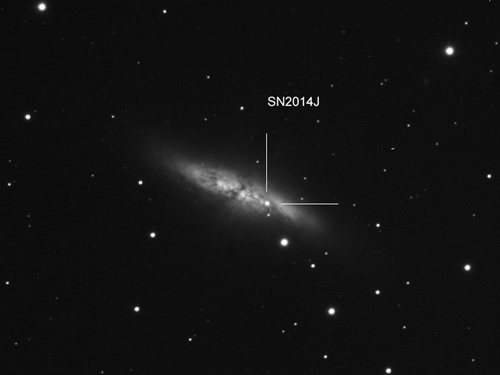 Supernova 2014J in M82 imaged by Mick Hunt of Lincoln Astronomical Society, January 2014. 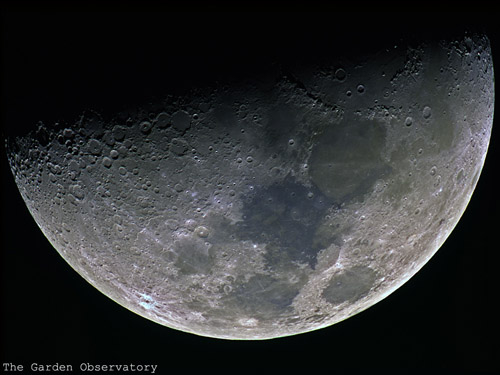 This was taken in poor conditions using his 190mm Maksutov Newtonian telescope. It was the sum of 15 x 240 second exposures. 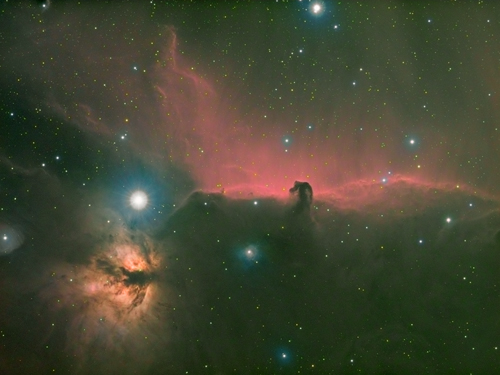 The Horsehead and Flame nebulas in Orion by Mick Hunt of Lincoln Astronomical Society, December 2013. 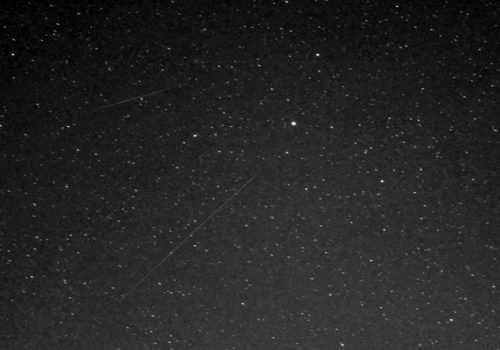 Geminid trails by Graham Winstanley of Lincoln Astronomical Society. They were taken with a Canon 1100D at ISO 3200, 30s unguided exposures with zoom at 24mm. The bright star near the centre of the frame is Regulus in Leo. The meteors were all around magnitude -2 and typically for Geminids there is no sign of any terminal flash that is common with the Perseids. The images were taken as RAW files and then converted to Jpeg and compressed. The telescope was a 300mm reflector at F10. 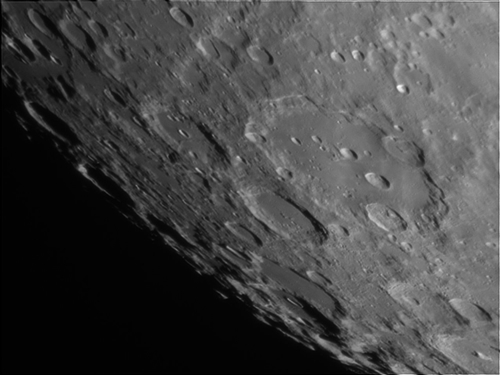 Images were taken with a Meade DSI2 black and white camera using the Meade Autostar software. Guiding was with AstroArt. Unguiding was helped by the wind. Processing was Registax 6 and Paint Shop Pro. 100 frames each at 50mS exposure. 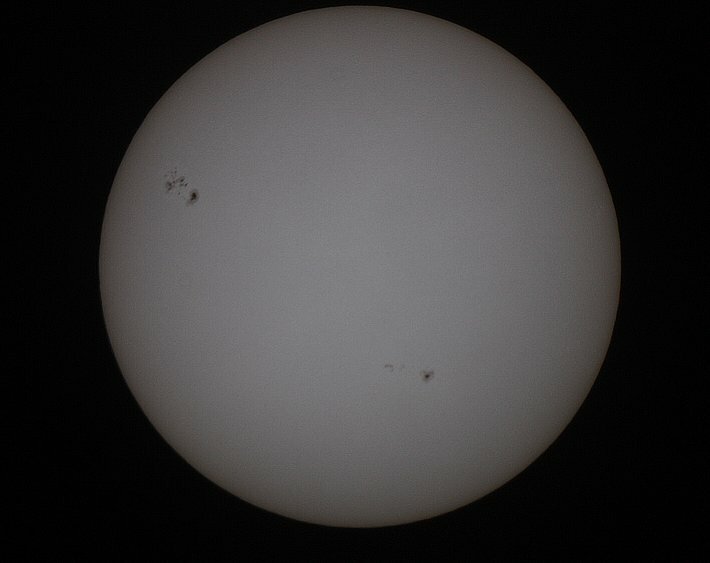 Phil used his ETX70 telescope with a solar filter. 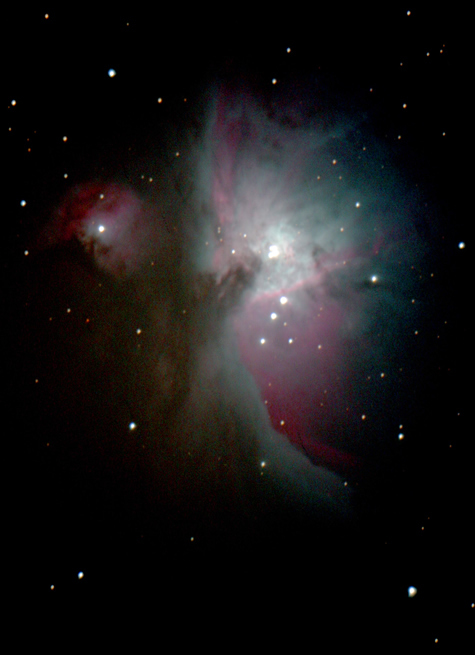 It was taken with an Orion Starshoot USB eyepiece camera. 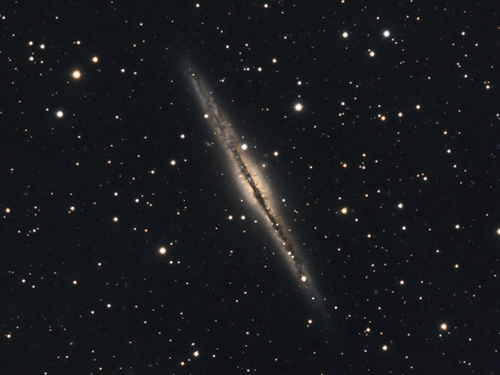 NGC891 is located about 30,000,000 Light Years away in the constellation of Andromeda. 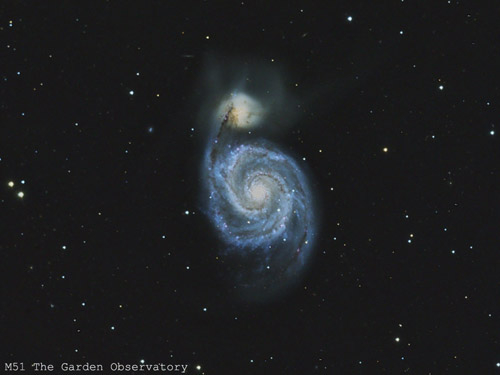 It's Magnitude +12.14, a Barred Spiral, probably very similar to our own Milky Way Galaxy and forms part of the NGC1023 Supercluster known as the Local Group. It was first observed by Herschel in October 1784. 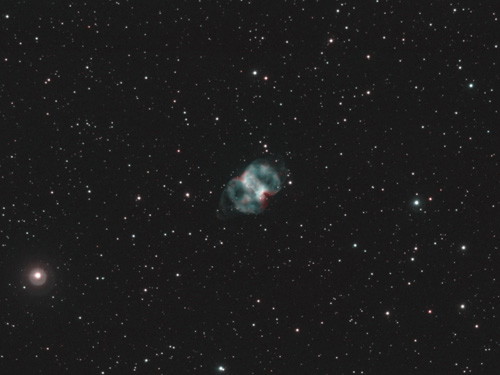 M76, also known as the 'Little Dumbell Nebula' is about 3,500 Light Years away in the constellation of Perseus. It was first observed in September 1780 by French astronomer, Pierre Méchain. Picture by Phil Norton of Lincoln Astronomical Society. Phil used his 12" telescope for this one. 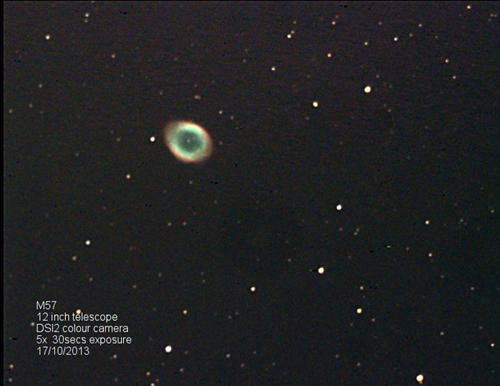 M57 is about 2.3K Light Years away in the constellation of Lyra and known as the 'Ring Nebula'. 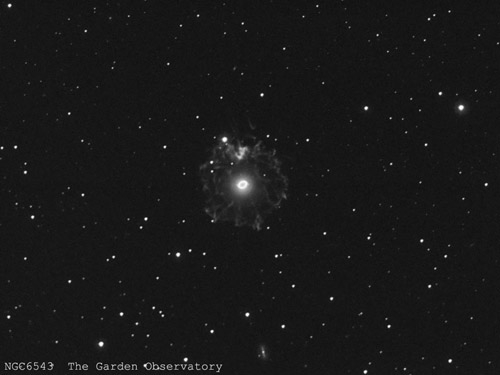 It's a Planetary Nebula, formed from an expanding shell of glowing ironised gas. This happens to Red Giant Stars towards the end of their life when the outer layers of the star are ejected in pulses into interstellar space. The result is the magnificent ring shape seen here. Phil used his 130mm telescope for this. 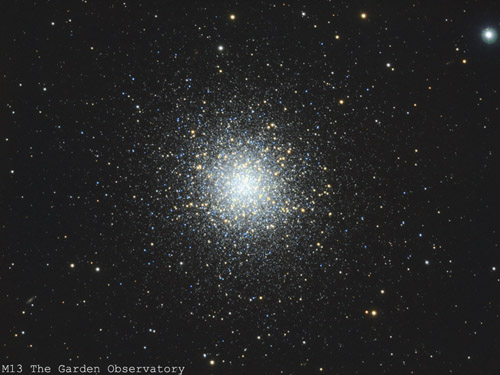 M15 is a Globular Cluster about 33K Light Years away in the constellation of Pegasus. Click HERE for more details. constellation of Lyra. Click HERE for more details. 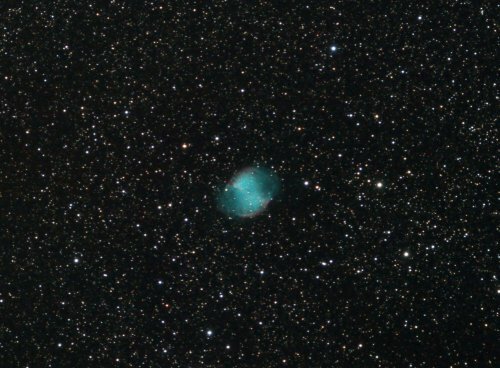 M27, also known as the 'Dumbell Nebula'. This is a Planitary Nebula and is 1.25K Light Years away in the constellation of Vulpecula, click HERE for more details. 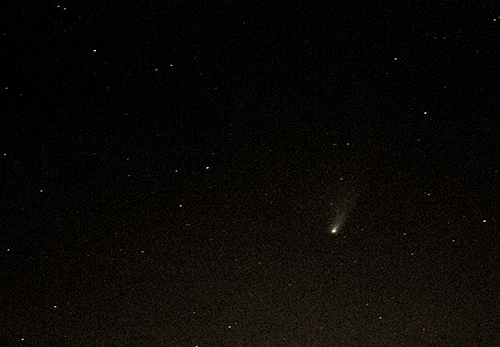 Photo of Comet PANSTARRS taken by Andy Langford of Lincoln Astronomical Society on 3rd April. No telescope, just a camera on a trypod. 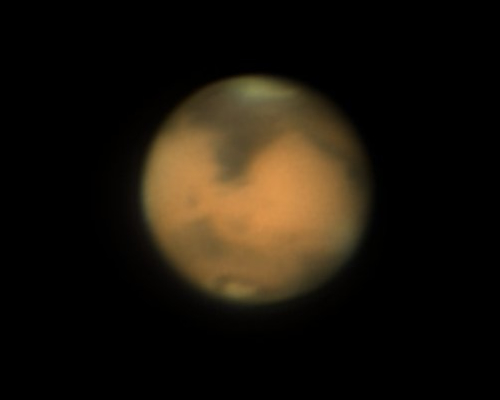 Mars taken by Graham Winstanley. I took these with my webcam with the 12” and 2 barlows. The seeing was not great so I am quite pleased with the result. You can almost imagine some canals joining the dark areas! 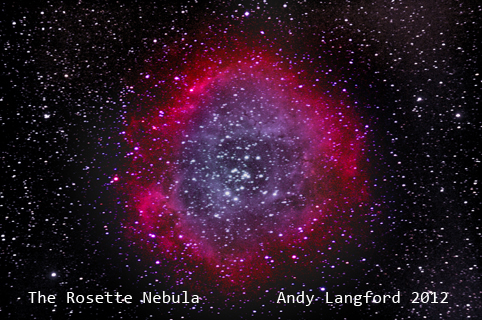 The Rosette Nebula by Andy Langford of LAS. He says it was the best he could do without a tripod. Taken on 1st Feb 2012 by Phil Norton. 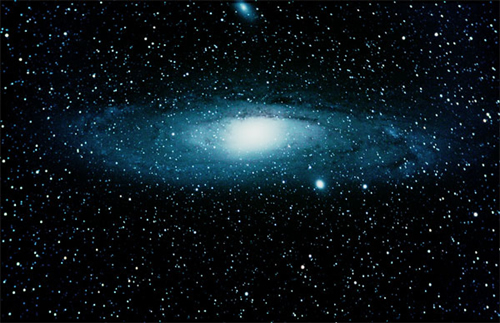 A spiral galaxy approximately 2.5 million light-years from Earth in the constellation Andromeda. 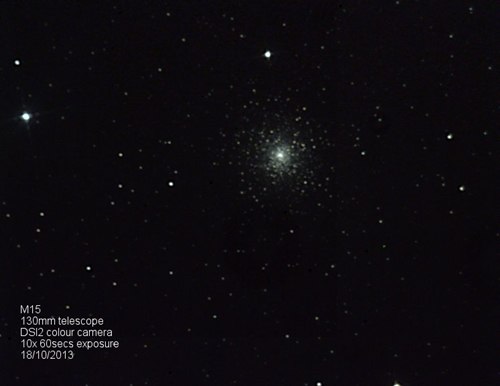 Taken using a Canon 40d DSLR connected to Sky Watcher Equinox ED80 25 x 2 min Lights and 15 x 2 min Darks. 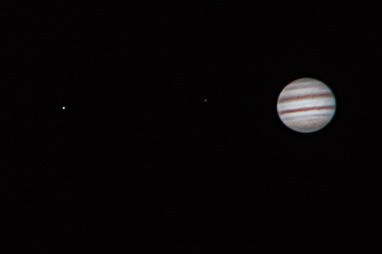 Jupiter and 2 of it's moons. Taken with Canon 40d connected to SE6 - used as webcam with BackyardEOS. 1 min AVI then stacked in Registax. 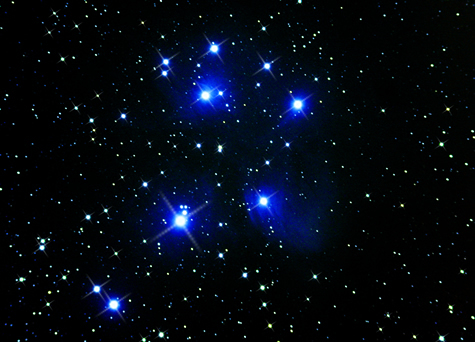 M45 – The Pleiades, or Seven Sisters. 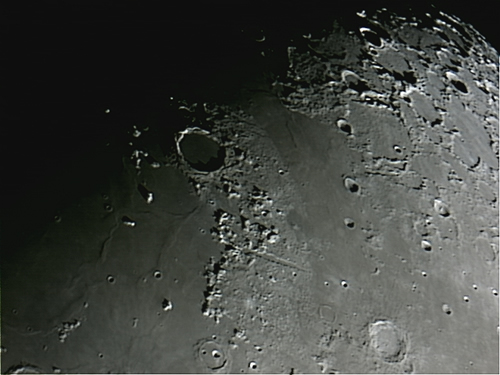 Taken using a Canon 40d DSLR connected to Sky Watcher Equinox ED80 20 x 2 min Lights and 10 x 2 min Darks. 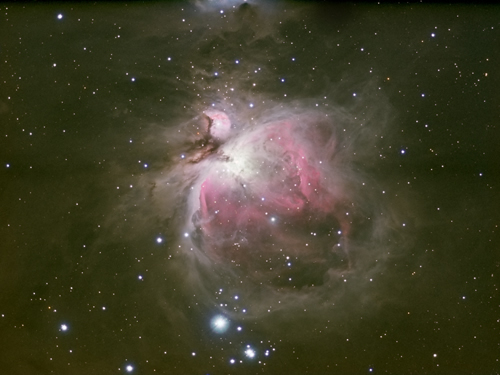 M42 - The Orion Nebula.